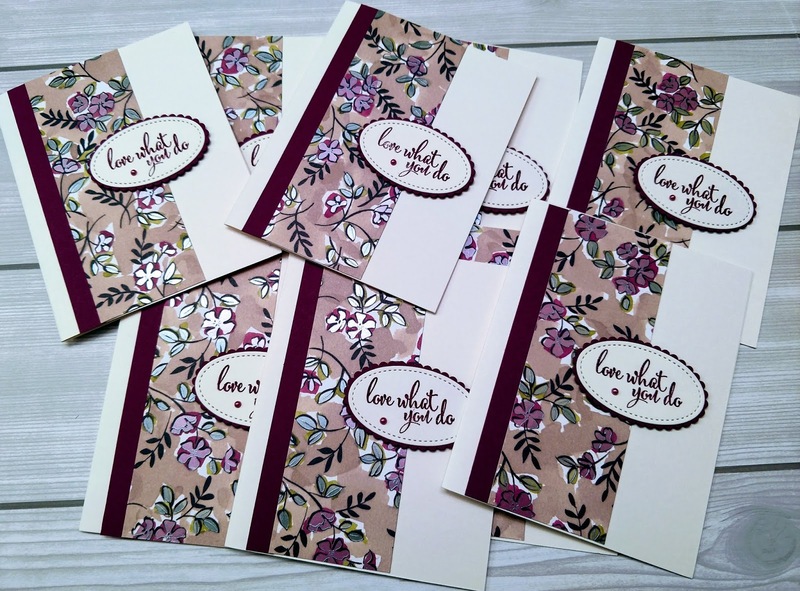 Our team's monthly swap challenge was to create a project using the Share What You Love Suite. This suite will be available in the 2018 Stampin' Up catalog that will be out June 1st. The suite has lots of awesome and beautiful products. I've never done a One Sheet Wonder and I decided to showcase the "Share What you Love' Specialty Designer Series Paper. The 2018-2020 in-colors will be available June in the new catalog. Cut very vanilla card stock 8 1/2" x 5 1/2", score @4 1/4"
Cut rich razzleberry card stock 1/2" x 5 1/2"
Cut dsp 2" x 5 1/2"
Using big shot and the 2 1/8" stitched square and 2 1/4" stitched oval using the very vanilla card-stock. 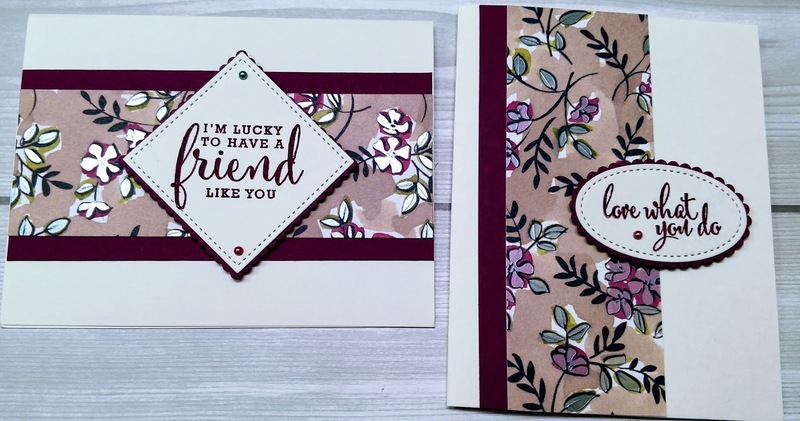 Using big shot and the 2 1/2" scalloped square and 2 1/8" scalloped oval and cut the rich razzleberry card stock. 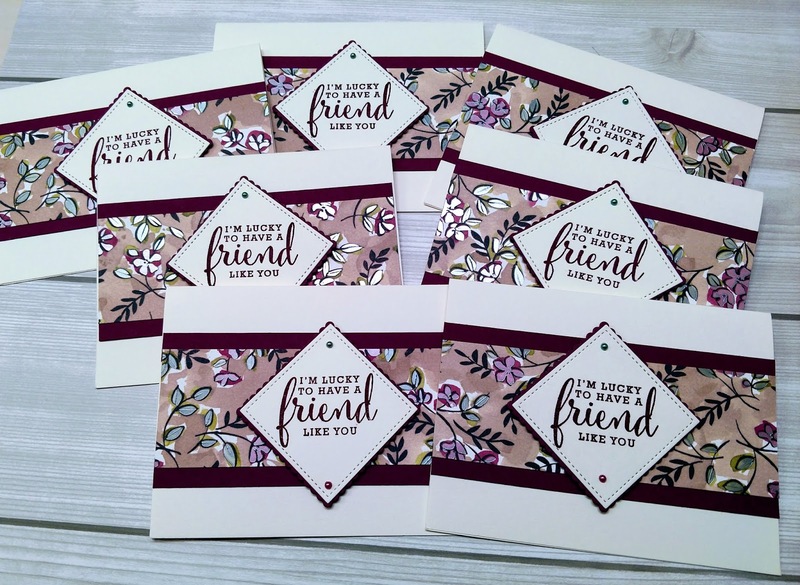 Stamp the sentiment on very vanilla stitched shapes using the rich razzleberry ink pad. Attach rich razzleberry strips to DSP using snail adhesive. Attach very vanilla stitched shapes to rich razzleberry scalloped shapes using snail adhesive and set aside. Attach the DSP layer to the card base using snail adhesive. Attach sentiment layer to top layer using dimensionals. Add faceted dots to the sentiment layer.